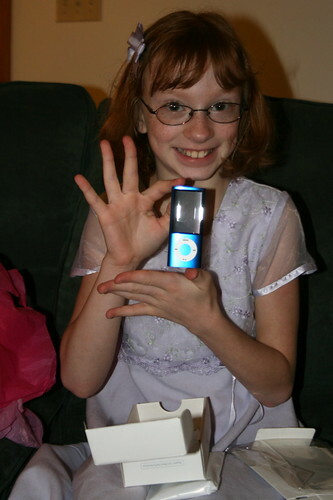 Nine years ago today our first red head was born. NINE YEARS! Wow. Mattey celebrated all day. She started with opening her presents from us since the rest of the day was going to be busy. She was thrilled with one of her gifts. Can you tell? She took blueberry muffins to school for her birthday treat. (They aren't allowed to bring in unhealthy foods anymore. That's not any fun.) After school Mat's friend came home with us. After picking up Meg we went shopping for a fun craft. We got flip flops from Old Navy and then got some trimmings to decorate them with. They turned out so cute. I might have to make myself a pair. We had pizza and watched a movie. Then we sang "Happy Birthday" to Mattey and had a cupcake. I heard her say a few times today that this is her "best birthday ever". I hope they don't go down hill from here. Happy Birthday, Mat! We love you.